On any given Sunday, football functions more like a national religion than a sport. Millions of fans gather every weekend in autumn to take in the grace, drama, and pageantry of the game. In fact, we love football so much we’ve become blind to its dangers. Simply put: the game isn’t good for us. Medical research confirms what the headlines keep reporting: football causes brain damage. Beloved Hall of Famers are now suffering from dementia and taking their own lives. It’s not just the pros who are suffering, either. Children and teenagers are susceptible to the same sorts of injuries, with the same long-term results—perhaps even more so. 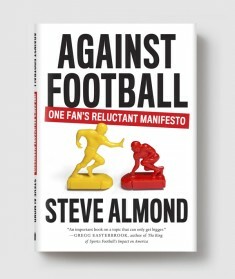 But football’s psychological and economic hazards—though more subtle—are just as profound. • How did a sport that causes brain damage become the leading signifier of our institutions of higher learning?